When you eat a low-carb ketogenic diet, your entire metabolism shifts. Your blood sugar drops, your body fat burns, and you start producing ketones — little bundles of fat-based fuel that provide your brain and body with clean, efficient energy. But how do you know if your new diet is working? Getting into ketosis takes a few days, and unless you know the common symptoms and side effects of ketosis, it’s not always obvious when your body is making the fat-burning shift into keto. This article will teach you how to figure out when you’re in ketosis, and which short-term ketosis symptoms you should watch for — both good and bad. Going keto promotes a lot of favorable changes to your body and brain, from weight loss to better energy. You’ll probably lose significant weight in your first couple weeks of keto. It won’t be all fat loss (that comes later); it’ll mostly be water weight that you lose when you burn through your glycogen stores. Glycogen is your body’s stored form of glucose (sugar), and on keto, you don’t need much of it[*]. When you’re in a calorie deficit on keto, your body turns to stored body fat instead. Glycogen is mostly water — three molecules of water for every molecule of glucose — so when you burn through your glycogen stores and don’t refill them by eating carbs, you lose several pounds of water weight[*]. If you’re on the keto diet for fat loss, don’t worry: that happens next. Don’t be discouraged if your weight loss slows down after a couple of weeks on keto. The initial weight loss was likely water. Fat loss comes next, and it’s more gradual — but it’ll happen. If hunger feels less pressing to you and you find it’s easy to go 5-8 hours without food or cravings, there’s a good chance you’re in ketosis. Keto shifts your metabolism from sugar-burning to fat-burning, which takes blood sugar fluctuation and insulin off the table. On keto, your blood sugar stays consistently low and stable, which means you don’t get the energy rollercoaster of sugar highs and sugar crashes. Ketones are also an exceptionally efficient energy source; your mitochondria, the powerhouses of your cells, produce more energy with fewer free radicals (inflammatory byproducts of metabolism) when they burn ketones [*]. If you have steady, plentiful energy throughout the day, odds are you’ve switched from burning sugar to burning fat for fuel. Both glucose and ketones cross the blood-brain barrier to fuel your brain. But sugar causes brain fog and inflammation when you get too much of it[*]. Ketones have the opposite effect. In one study, for example, elderly adults achieved better mental performance after ingesting MCT oil — a compound that goes straight to your liver for ketone production[*]. Mental clarity is one of the most commonly cited benefits of a ketogenic diet. If you feel improved focus, you may be in keto. 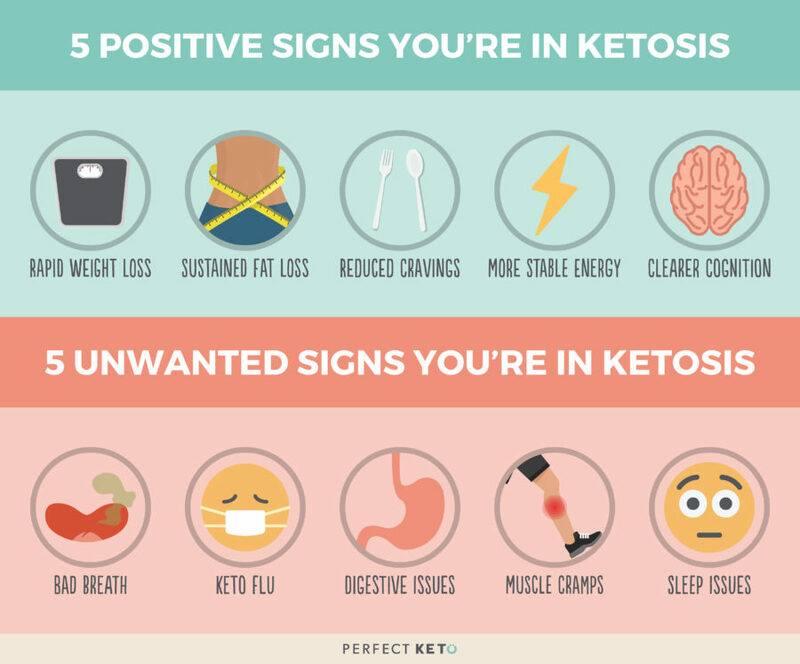 There are plenty of researched-backed benefits to keto, but getting into ketosis can come with a few side effects as well. When you start burning fats for fuel, one of the ketone bodies you produce is acetone. When you’re first transitioning into keto, you may release acetone through your breath. It doesn’t happen to everyone, but it can be a side effect of ketosis (called “keto breath”). Acetone is the main ingredient in nail polish remover. It smells sweet, fruity, and a little bit like gasoline. If your breath smells that way, you’re probably producing more acetone than usual as your body adapts to keto. The good news is that keto breath usually goes away after you’ve been in keto for a few weeks. Keto flu describes the flu-like symptoms that come from your body’s transition from burning carbs to burning fat. It takes your body a few days to switch over, and during that time there’s a lot going on with your biology. Your kidneys begin expelling water and electrolytes as your glycogen stores deplete. You often also get sugar and carb withdrawal, which feels similar to caffeine withdrawal[*]. Keto flu typically lasts about two weeks after you cut carbs from your diet. You can do a few different things to address the symptoms of keto flu. A well-formulated electrolyte and extra water will replenish the water and electrolytes your kidneys expel, which prevents dehydration[*]. Your transition into ketosis is not a time to cut calories, either. You can save that until you’re fully in keto (at which point there’s a good chance you’ll eat under calories without thinking about it, because keto is so satiating). For the transition, though, load up on as much fat as you need to feel full and energetic. If you’ve followed the best practices for starting keto, and you’re still experiencing symptoms after a couple of weeks, consider backing off. Keto isn’t perfect for everyone, and it may not be ideal for your unique biology. Some people experience digestive distress in the first couple of weeks of keto. The problem could be inadequate fiber — the indigestible material that feeds gut bacteria and stimulates healthy bowel movements[*]. When you cut out carbs, you’re also cutting out many fiber-rich foods — so be sure to replace them with low-carb, fibrous vegetables like kale, broccoli, and asparagus. For more dietary guidance, check out this list of keto-approved foods. If you cramp up on keto, don’t panic. The causes are probably easy to fix. Muscle cramps in keto are usually related to dehydration and depleted electrolytes[*]. Make sure you drink plenty of water and take a high-quality electrolyte supplement with potassium, magnesium, and sodium. You may have trouble sleeping during your keto transition. Usually, it’s because of carb withdrawal. Sugar is physiologically addictive, and cutting it out causes withdrawal symptoms, one of which is insomnia[*]. Your body may also be protesting the lack of carbs in your diet because it’s caught in limbo: it hasn’t adapted to burning fat yet, but it also doesn’t have any carbs to use for fuel. As a result, your brain can release cortisol around 2-4 AM, telling you to wake up and find food. Insomnia usually resolves after a couple of weeks in keto, if not sooner. In the meantime, you might experiment with melatonin — a safe and effective natural sleep supplement[*]. The above signs and symptoms are subjective ways to tell whether or not you’re fat-adapted. If you want hard data on your metabolic state, you can also use tests to measure your body’s ketone production. Blood testing is the gold standard for measuring ketosis. You can have blood ketones measured at the lab, or you can do it yourself at home with a ketone meter and test strips. Be aware: the at-home method calls for a pinprick and drop of blood. Blood testing measures blood levels of beta-hydroxybutyrate (BHB) — your primary energy ketone. If your blood BHB levels are above 0.7 mmol/L, you’re getting into ketosis[*]. If they’re above 1.0 mmol/L, you’re in deep nutritional ketosis. You can also use test strips to figure out the level of ketones in your urine. Urine testing isn’t as accurate as blood testing, but it’s cheaper and more convenient, and it doesn’t require pricking yourself with a needle. Generally, urine strips turn a certain color — displayed on the bottle — when they contact your ketogenic pee. The color indicates your depth of ketosis by measuring levels of acetoacetate — the predominant ketone excreted in urine. The best times to measure urinary ketones are early in the morning and after dinner[*]. Getting started is easy. Just buy ketone test strips (Perfect Keto Test Strips, for instance), pee on them, and get your result in seconds. Ketone breath tests measure acetone on your breath. Remember acetone? It’s the nail polish remover ketone that gives you keto breath. In one study, researchers showed that breath acetone correlated with blood and urinary ketone measurements.[*]. Ketone breath testing is newer than other methods, and less accurate than blood testing, but it’s a convenient way to test your ketone levels. There are a variety of different signs that you’re in ketosis, as well as objective tests to figure out your ketone levels. Ketone testing can be useful, but it’s not necessary if you don’t want to go to the trouble. As a rule of thumb, you should be able to get into ketosis after cutting out carbs for two to three weeks. 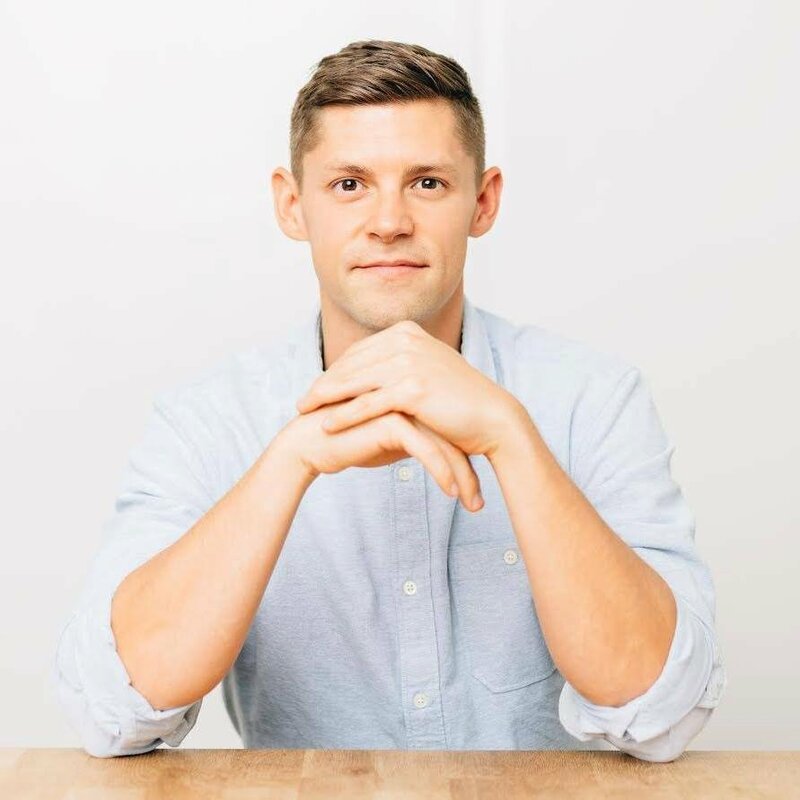 If you’re looking for help getting started with keto, check out this simple, complete guide to starting a ketogenic diet. It’s easier than you might think, and after the initial adaptation phase, there’s a good chance you’ll feel amazing. And if you don’t feel great, maybe full keto isn’t for you. Consider trying a modified keto diet that incorporates more carbs while still giving you many of the benefits of ketosis.